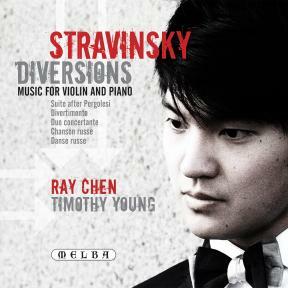 Ray Chen's debut recording, accompanied by another fast-emerging Australian talent, pianist Timothy Young. 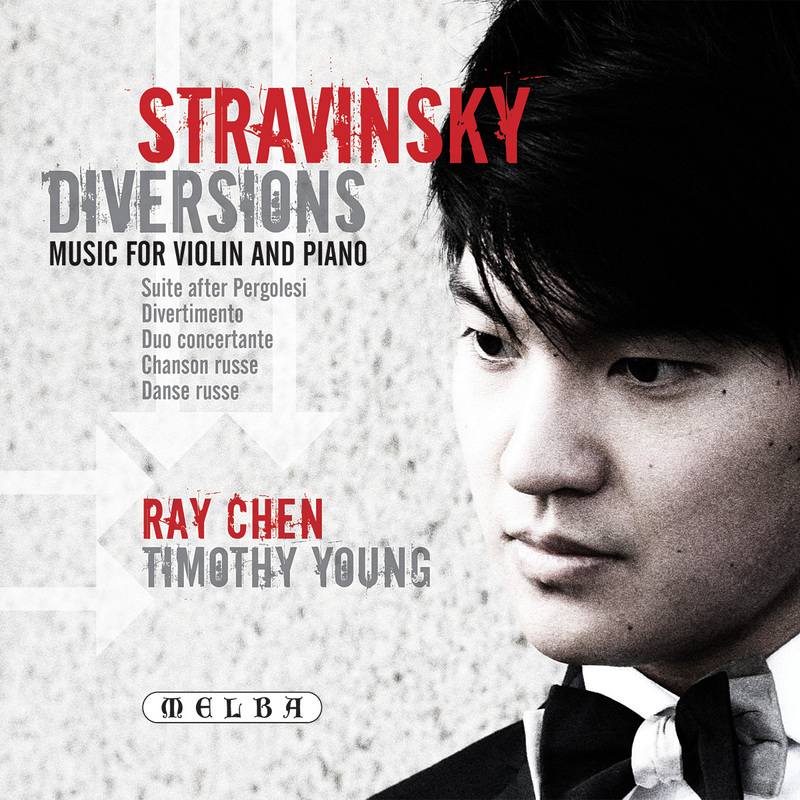 Rising star of the violin Ray Chen , winner of the Queen Elizabeth International Music Competition, makes his debut recording on Melba Recordings, accompanied by another fast-emerging Australian talent, the pianist Timothy Young , on Diversions, a disc of scintillating chamber music that presents Stravinsky at his most entertaining, his spirit brimming with optimism and bravura. The pieces—Suite after themes, fragments and pieces by Giambattista Pergolesi, Duo concertante, Divertimento, ‘Russian Maiden’s Song’ from the opera Mavra and the ‘Danse russe’ from Petrushka—are perfect vehicles to showcase Chen’s violinistic bel canto, his luminous tone and his off-the-scale technique, all to be expected given his competition pedigree. But Stravinsky’s music also provides Chen with the perfect vehicle to demonstrate his genius for vivid musical story-telling. This recording marks Chen as an exciting musical personality as well as a remarkable virtuoso. While Stravinsky’s violin and piano writing of this music is never less than virtuosic, the performers toss off these technical difficulties with the greatest bravura. The impression we are left with is of the most vivid musical storytelling and youthful joy. Virtuoso performances of the golden age of the great Russian violin school of Leopold Auer (Heifitz, Zimbalist, Elman et al.) could be characterised as possessing a monumental magnitude of technique, a beauty of singing cantilena, a radiant and ravishing tone and most importantly the ability to tell a spellbinding story in music. By this description Ray Chen is truly a virtuoso of the old school. In his Chroniques de ma vie (1935/36) Igor Stravinsky confessed that during the early part of his career he had never written music for solo strings and piano for the simple reason that this particular combination of instruments held little appeal for him. Yet his attitude was to change in 1930 as a result of meeting the Polish-born American violinist Samuel Dushkin at the home of Willy Strecker, the director of the publishing firm Schott. Strecker was particularly keen to encourage Stravinsky to write a violin concerto and hoped that Dushkin would act as his mentor, much in the same way that Joseph Joachim had worked with Brahms on his concerto for the instrument some 60 years earlier. Strecker’s decision proved to be enormously shrewd. Although Stravinsky could be notoriously prickly, holding particular contempt for egocentric virtuosi, he immediately warmed to Dushkin, appreciating not only his considerable gifts as a soloist, but also in his own words ‘a musical culture, a delicate understanding and—in the exercise of his profession—an abnegation that is very rare’. The collaboration between the two men was indeed unusually amicable, Dushkin’s sympathetic technical advice enabling Stravinsky to make very rapid progress in completing the concerto. Despite a poor contribution from the orchestra, the premiere of the Violin Concerto in Berlin in October 1931 was relatively successful, and Stravinsky was keen to continue his partnership with Dushkin. Given the uncertain economic climate during this period, however, he also realised that it would be unrealistic to devote his energies to writing a second violin concerto. A more judicious course of action would be to focus his attention for the moment on chamber music. Putting aside his previous objections towards writing for violin and piano, he began a new composition entitled Duo concertante (Tracks 12-16), completing it in the summer of 1932 and presenting its first performance with Dushkin in Berlin in October of the same year. Whilst he was at work on the Duo concertante, Stravinsky turned his mind towards considering the most effective way in which he and Dushkin could promote his new composition. In a letter to Strecker, Stravinsky outlined an idea to present the Duo concertante as part of a full-length recital of violin and piano pieces that might interest concert agents. To overcome the relatively short duration of the Duo concertante, as well as Stravinsky’s unwillingness to flesh out the programme with music by other composers, he decided to collaborate with Dushkin on creating a series of transcriptions of some of his other works. Amongst the first pieces they arranged were excerpts from the early ballets The Firebird and Petrushka and the opera The Nightingale. As a result of securing a number of performing engagements, in particular concert tours of England and France in 1934 and the United States in the following year, Stravinsky and Dushkin added further transcriptions during this period including the Pastorale and the Divertimento from the ballet The Fairy’s Kiss. The present recital features some of the most substantial works that emanated from the Stravinsky/Dushkin partnership. At its centrepiece is the Duo concertante, effectively a five-movement sonata for violin and piano, which demonstrates a striking originality in the way the two instruments relate to each other. Stravinsky claimed that the inspiration for this work derived from a recently published book by Charles-Albert Cingria on Petrarch. In particular he was struck by the sentiment that ‘lyricism cannot exist without rules’. Expanding on this point, Stravinsky suggested that he had attempted to create a ‘lyrical work of musical versification’ whose spirit and form were largely stimulated by the ‘pastoral poets of antiquity and their scholarly art’. Many commentators have been hard pressed to draw an unequivocal connection between these statements and the work itself. True, Stravinsky gives titles that are associative of ancient Greek poetry to some of the movements, yet the lyrical element to which he gave such emphasis is only evident sporadically. For example, although the first movement is called ‘Cantilène’, it hardly follows the conventional expectations that are associated with such a designation being dominated by two distinctly percussive musical ideas, the first placing a sequence of disjunct arpeggio figures against a cimbalom-like one-note repetition in the piano and the second developing a more forceful double-stop passage for the violin. The first ‘Églogue’ follows in a similar vein opening with an ostinato pattern in the piano over which the violin traces a folk-like melody accompanied by a drone open A string. After this comes a cadenza-like passage in the violin partnered by a continuous stream of semiquavers in the piano, the string writing here recalling similar passage work in Ragtime and The Soldier’s Tale. In the extended fourth movement ‘Gigue’, Stravinsky replaces the torrent of semiquavers in the piano with lively triplet patterns in an exhilarating tarantella rhythm. More lyrical features predominate in the second ‘Églogue’ where Stravinsky recalls the cantabile violin lines of the two Arias from the Violin Concerto. Furthermore, the mask of detachment so characteristic of Stravinsky’s neo-classical style seems to evaporate in the ‘Dithyrambe’ where an effusion of heartfelt melancholy builds up to an intense climax and appears to capture the same celestial atmosphere that characterises the closing bars of Apollon musagète and Symphony of Psalms. The transcriptions encompass a wide range of Stravinsky’s theatre works and provide a triumphant demonstration of the degree to which his collaboration with Dushkin exceeded conventional norms. As the violinist later recalled, Stravinsky’s intention was never to provide straightforward arrangements that merely served as idiomatic display pieces. Rather his objective was to go back to the original works and recreate the music almost anew in the spirit of the instruments and with specific regard to the individual character of the performer. This quality is evident in the ways in which the material is imaginatively distributed between the two instruments in the Danse russe (Track 18) from Petrushka, a piece that had already enjoyed widespread dissemination in the concert hall as a result of the piano transcription made by the composer for Artur Rubinstein in 1921. In the original work, this dazzlingly infectious movement with its obsessive mechanical patterns and passages of rhythmic displacement appears at the end of the first scene in which the Showman first brings the three protagonist puppets (Petrushka, the Ballerina and the Blackamoor) to life. Another work that exploits a distinctly nationalist vein is the Russian Maiden’s Song (Track 17) from the opera Mavra, which Stravinsky and Dushkin transcribed in 1937. This aria, sung by Parasha and appearing in the original score after the Overture, has a distinctly ironic tone resulting from a deliberate and entirely characteristic disjunction between the melodic line and the piano accompaniment. For the two more extended transcriptions featured here, Stravinsky drew his inspiration from the work of other composers. A huge selection of Tchaikovsky’s songs and piano pieces provided the melodic backdrop for the ballet The Fairy’s Kiss, which was commissioned by the dancer Ida Rubinstein, loosely based on Hans Christian Andersen’s fairy tale The Snow Maiden and first staged in 1928. Six years later Stravinsky extracted a 20-minute orchestral suite entitled Divertimento (Track 6-11) from the full ballet which received its first performance in Paris in November 1934. Dushkin and Stravinsky unveiled the premiere of the violin and piano version of the Divertimento the following month in Strasbourg. Its four movements effectively trace much of the action in the ballet but Stravinsky excludes the final section of the score. In the Prologue (‘Sinfonia’), a child separated from his mother by a storm is marked at birth by the kiss of the fairy. Eighteen years later he appears at a village fête (‘Danses Suisses’) experiencing his moment of greatest happiness. The fairy reappears in the flighty Scherzo leading him once again to his fiancée (the ‘Pas de deux’). In the Suite after themes, fragments and pieces by Giambattista Pergolesi (Tracks 1-5) Stravinsky revived and transformed music that was believed to have been composed by the early 18th-century composer who was born in Naples. He originally incorporated this material into his ballet Pulcinella, first staged in 1920 and which became a major transitional work in his development away from Russian nationalism towards neo-classicism. As with The Fairy’s Kiss, Stravinsky extracted an eight-movement orchestral suite from the complete ballet which became very popular in the concert hall. His arrangements of five of these movements for violin and piano exist in two versions, the later one composed in 1932 for Samuel Dushkin and often known as the Suite Italienne. The present performers, however, have opted to feature the first and more overtly virtuosic transcription made in 1925 at the request of the Polish violinist Paul Kochanski, best remembered these days as the pioneering interpreter of Szymanowski’s First Violin Concerto.